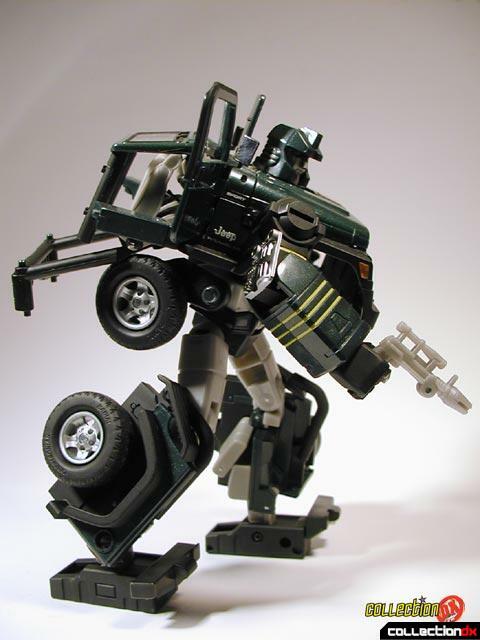 Hound was the third vehicle released in the Transformers Alternators line, and the first vehicle that was not a sports car. 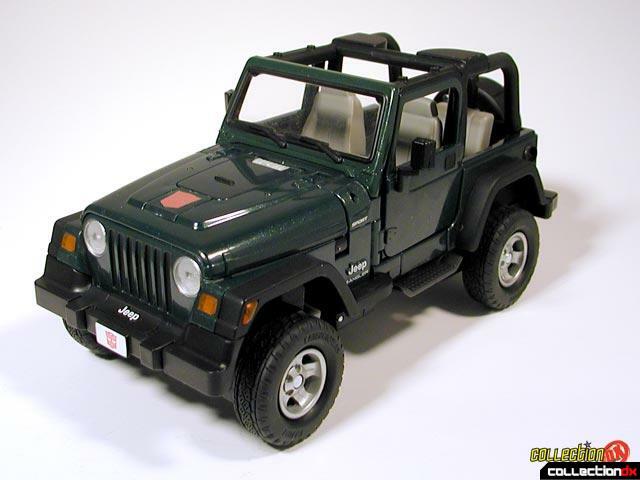 Hound is a 2003 Jeep Wrangler Sport. 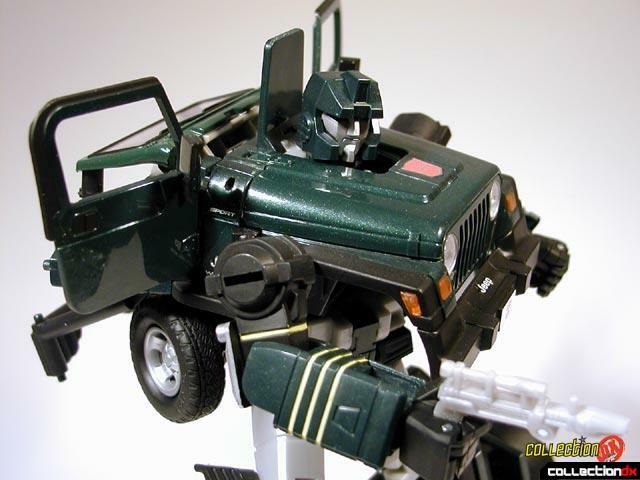 In vehicle mode, Hound features rubber tires, independent suspension, opening doors and hood, detailed interior, and a storage compartment in the spare tire that holds his gun. Hound does not feature tandem steering like the other Alternators do. Robot mode is a little odd at first, but he grows on you. I don't personally like the way they handled the back of the robot. Things just kind of hang off his back. Otherwise he is pretty cool, and fairly articulated. He can hold a small gun in his hand that is stored in the spare tire. Hound is also the first Alternator that has a gun that is not from the engine. The rest is pretty typical Alternators fare: realistic vehicle mode, quality construction, intricate transformation.. Not much wrong with him. He looks great and is fun to play with. I own an original Japanese "Binaltech" BT-04 Hound. Aside from the die-cast metal in the original version, both the BT and the Alternators line toy are identical in every other way. My biggest problem with Hound are his joints. While his wrists have pretty good movement, his elbows can't swivel side-to-side. His hips suffer from a simmilar ailment even though they are on ball/socket joints! And because of the limits of his hips, the tightly-snapping joints at his ankles do not compensate correctly. 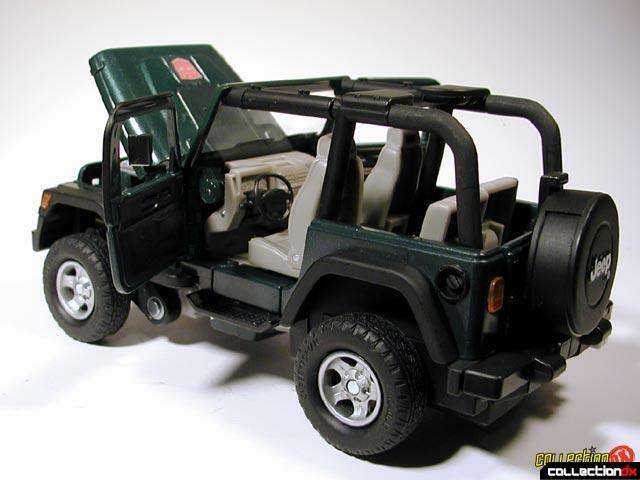 These are joint issues that aren't a problem with most of the others in the "Binaltech"/"Alternators" line. I liked the look of Hound 'n all. 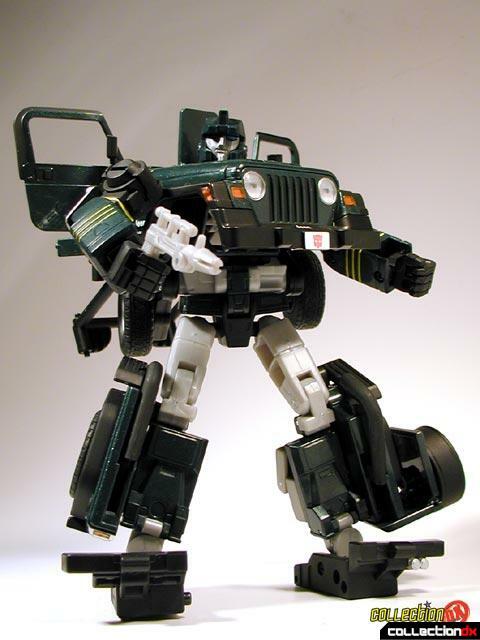 But these joints kinda killed it- which was part of the appeal ot these realistic-looking Transformers.